A study has shown that an intense work out for two and a half minutes can cause a calorie burn of 200 calories throughout the day. And this is definitely good news to preoccupied individuals with busy schedules who want to lose weight. This proves that going after weight loss may not require all of the time and devotion you may think it does. A simple but intense two to three minute workout can go a really long way. And below are a number of workouts that will actually help you burn 200 calories quickly. Box steps: Box steps or box jacks is an exercise with targets areas in the lower body including the hamstrings, quads and glutes. To begin, get a box, or stool, place a foot on the box making sure the foot is placed on the top surface, then pull your body up with the first foot until your second foot joins the first on top of the box. Next lower yourself back down using one foot. Frogger: this exercises’ target areas is the abs or abdominal muscles. To begin position your body in either a push up or plank position, jump both feet up to the outside of your hands until you assume a frog-like stance then jump back to the plank/push up position and repeat. High knees: the high knee exercise is an intense combination of running motion and exaggerated knee lifts. The goal is to thoroughly engage the core by maintaining an upright posture while lifting knees to your midsection. Jump squats: jump squats primarily target the hips, quads and glutes. To jump squat you begin by assuming a squat position with arms at your side, then jump straight up, landing with slightly bent knees resuming the squat position. Jumping jacks: jumping jacks is a basic common exercise which is very easy to do. First, you stand with your feet together and hands at your side, then in a singular motion, jump out with your feet to the side and raise your arms above your head you finish by jumping back to start position and repeat. Mountain climbers: this cardio move is highly beneficial to the core, quads and hamstrings. You begin with a plank position, then you lift your knee forward to your midsection, push back the first knee and repeat this with your other knee. For best results you can alternate movement of both knees. Walking lunges: to do this, begin by standing legs apart with hands on your waist. Next make a forward step, and descend till your rear knee nearly touches the ground, pull yourself back up and repeat the lunge with the opposite leg. These lunges help to develop the lower body, balance, and overall core strength. It important to maintain form to prevent injury. Running up stairs: running up and down stairs also helps in toning glutes and quads. Exercise is important, it helps you to stay healthy, prevents diseases, and boosts your energy throughout your life. 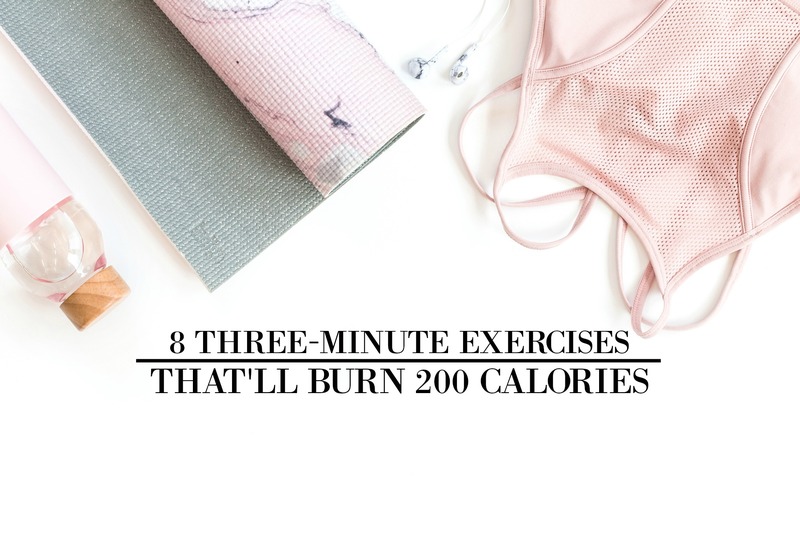 Don’t limit your exercise to just 3 minutes though; try expanding it to burn even more than just 200 calories a day and you’ll see amazing results! For the best results, health specialists recommend at least 150 minutes a week. So give these a try and let me know what you think!